The second edition is still available for free as both a pdf and a MobiPocket e-book file. This is the home page of David Friedman. Not the Hawaiian artist David Friedman, or the composer David Friedman, or the fix-what's-wrong-with- government David Friedman (050) or the fifteen year old David Friedman or the eighteen year old David Friedman or the legendary film pornographer David Friedman or even the economic journalist David Friedman but the anarchist-anachronist-economist David Friedman. Now you know why I included my middle initial. This page has links to my work in a variety of areas, published and unpublished. It is still under construction--and always will be. this crowd more than others might appreciate when I say that polyamory is just plain WRONG! It should be "multiamory" or "polyphilia"
Living Paper: An Open Source Project to produce computer programs that teach economic ideas. I have now finished my book on legal systems very different from ours, with one chapter each contributed by Peter Leeson and David Skarbek, and published it on Amazon as both a paperback and a kindle. Interestingly enough, the kindle is selling more than twice as many copies as the paperback. My first novel, published by Baen, is historical fiction set in an invented historical background (or, if you prefer, fantasy without magic). It has a web page showing the lovely map created for me by Chris Porter. The book is available as an eBook and in hardcopy, and I have webbed podcasts of the entire book, read by me. Baen also has a webbed interview with me about the book. My second novel, this time a fantasy with magic is up on Amazon as a Kindle file. 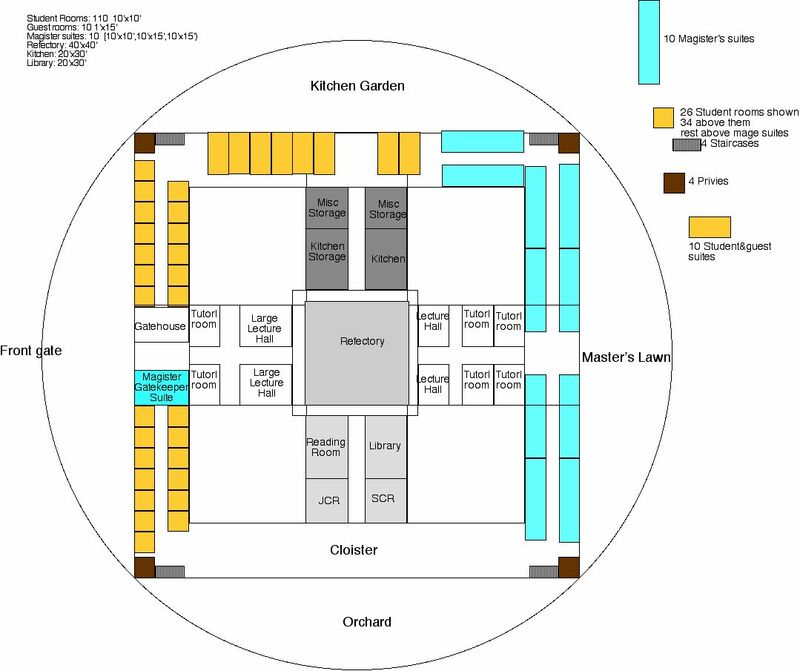 The map of the college. My most recent project is a collection of short works of literature that contain economic ideas. The draft is up for comments as a web page. I have now webbed the online version of my most recent book, Future Imperfect; comments welcome. My book Law's Order: What Economics Has to Do with Law and Why It Matters, published by Princeton University Press, is accompanied by a book web page which contains images of the entire book along with an extensive system of links--think of them as virtual footnotes--to additional material. An earlier draft is also webbed, in a somewhat more readable form, but without the links. An earlier book was Hidden Order: The Economics of Everyday Life, published by Harper-Collins. Click to see the Table of Contents and a sample chapter (on the economics of crime). Copies are available from Laissez-Faire books and Amazon.com as well as many local bookstores. There is even a webbed transcript of my appearance on Book Notes discussing the book. German and Japanese translations of the book are also in print. Click here for the online errata--errors corrected as they come in, starting with Figure 3-1b. All of one earlier book of mine, Price Theory: An Intermediate Text, is available on the web, including the two chapters of the first edition that were left out of the second edition. All of my first book, The Machinery of Freedom: Guide to a Radical Capitalism (2nd edn) is now webbed, both as a pdf and as a MobiPocket e-book file. The first three parts are webbed as audio recordings. Drafts of an articles on The Market for Students and the future of stateless societies; some years ago I delivered a paper dealing with market failure and arguments for and against government at the Mont Pelerin Meeting in Reykjavik. I have just (4/9/13) webbed a new paper: Feud as Law Enforcement, Ancient and Modern or Why is There a Patent Troll Problem and How Can it be Solved? A conjectural explanation for concealed ovulation in humans. Ideas for research projects in economics that other people might like to do. I am recently retired from teaching at Santa Clara University in the Law School. My final semester I taught Economic Analysis of Law, and a seminar on Legal Systems Very Different From Ours. The web pages for both courses have links to video recordings of the classes and other relevant material. The pages for older courses, Legal Issues of the Twenty-first century, Intellectual Property Theory, and Analytic Methods for Lawyers, have audio recordings of the classes and related material. My wife says that when someone points a camera at me I look as if was facing a firing squad. I am not sure if this (from at talk I gave at Texas Christian University entitled "In Defense of Anarchy") is an improvement. If you prefer color, this one was taken on a visit to Iceland some years back, and this was taken, and webbed, by Declan McCullagh. In October of 1997, I had a televised debate on encryption regulation with Ed Meese. The transcript is now webbed. Detailed information on usage of this site.